1. Remove the thermostat cover screws and the thermostat cover. 2. Remove thermostat cover screws, O-ring, isolator and spring. Discard old thermostat. 3. Without marring the valve seat sealing surface, remove old valve seat. Note: It is necessary to replace the valve seat when installing the new thermostat. The new thermostat will not function properly without the new valve seat. 1. Install new valve seat (A) into cylinder head with chamfer facing out. 2. 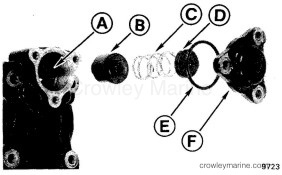 Install the thermostat (B), spring (C), and isolater (D) in the cylinder head. 3. Install O-ring (E) on thermostat cover (F) and install thermostat cover onto cylinder head. 4. Torque thermostat cover screws to 60-84 in. lbs. (7-9 Nm).